Over 30,000 farmers continued their long march towards Mumbai on Sunday to protest outside the Vidhan Sabha over Devendra Fadnavis led BJP government’s failure to respond to prevailing farm distress. The farmers’ “long march” has been called by Akhil Bharatiya Kisan Sabha (ABKS) and close to one lakh people are likely to join the protest march to state legislature where farmers are planning to gherao the state legislature on Monday. Farmers are demanding a complete farm loan waiver, transfer of forest land to tillers, implementation of the Swaminathan Commission’s recommendations, compensation of Rs 40,000 per acre to farmers hit by hailstorm and pink bollworm and putting a stop to sharing the state’s water with Gujarat. BJP government in Maharashtra has come under severe criticism for its “oppressive policies” against the farmers. “Farmers marching into Mumbai. To ensure that the BJP govt does not deceive them again. They should get their rightful due”, tweeted Sitaram Yechury, a senior leader of Communist Party of India (Marxist). All India Kisan Sabha (AIKS) has said, “Comrade Amraram, leader of Rajasthan farmers movement, and Vice President of AIKS will join the farmers march to Maharashtra Vidhan Sabha. Shiv Sena (NDA’s ally), Maharashtra Navnirman Sena (MNS) of Raj Thackeray and the Aam Aadmi Party (AAP) are supporting the farmers movement. “Shiv Sena, MNS, AAP and a few other social organisations have extended their support to the long march. We have accepted it. We will accept the support of those who come forward,” said Ajit Nawale, state general secretary of ABKS. 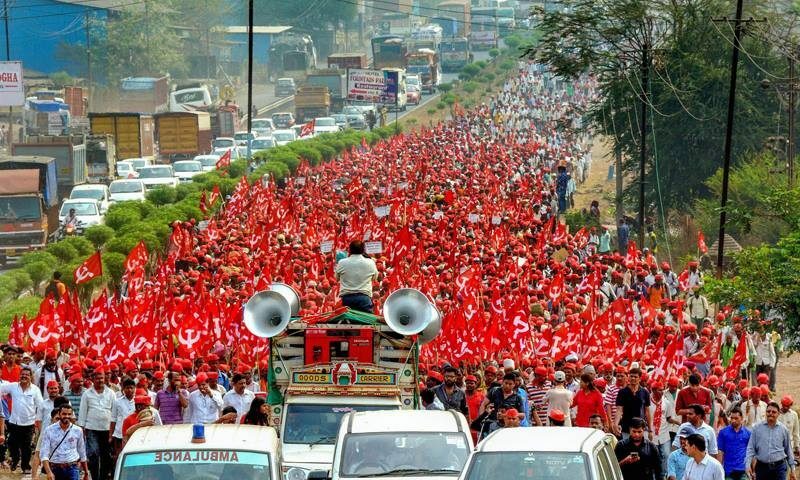 The farmers had started their march on Tuesday from the CBS Chowk in Nashik, the location of the March 2016 demonstration when close to one lakh farmers had gathered for two days.